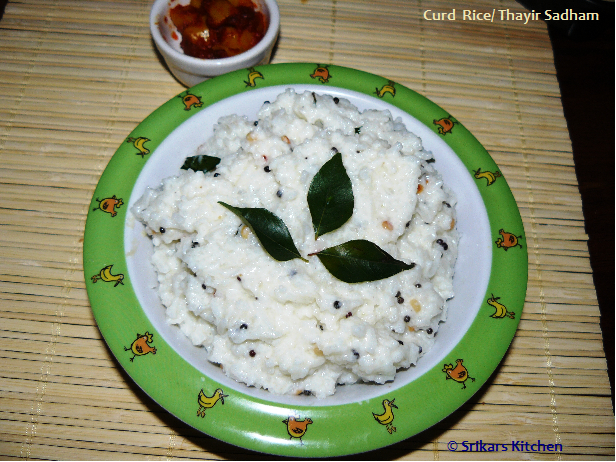 Curd rice or yoghurt rice is a popular south indian dish.This is one of the common menu for lunch or dinner. 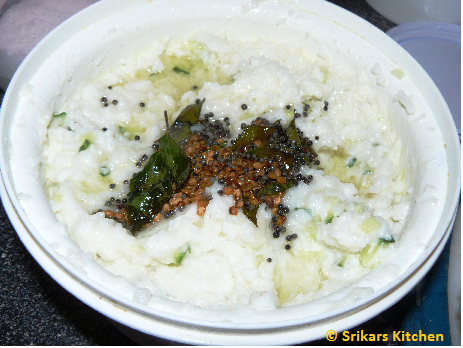 Vanthaya mangai pickle is best combination of this thayir sadham.This is neivedham recipe commenly used in temple . Take a bowl add cooked rice & mash it with laddle. Add yoghurt,salt & mix well. Add milk & mix well & Add chopped cucumber,raw mango & mix well. Heat oil in a pan, add mustard seed, urad dhal, curry leaves & allow to temper .and add to the rice. It's my staple food during summer time. Pics of Thayir sadam looks very inviting. பஹாளாபாத் [அருமையான ஹிதமான தயிர் சாதம்] அழகாக குளுமையாக மனதுக்கு மகிழ்ச்சியாக திருப்தியாக உள்ளது. பகிர்வுக்கு நன்றிகள். பாராட்டுக்கள். All time fav comfort food looks so delicious and yummy dear ! !